Extending nearly 38 miles, Alternate U.S. Highway 19 is the longest roadway in Pinellas County. It connects the cities of Tarpon Springs, Dunedin, Clearwater, Largo, Seminole and St. Petersburg as well as Palm Harbor in the unincorporated area of north Pinellas County. The configuration of the road and the character of adjacent land uses it serves vary widely throughout the corridor as do the traffic issues experienced by the people who use it. 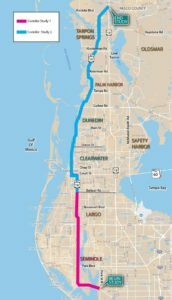 Approximately 30 miles of this corridor, extending from Park Street in Seminole to the Pinellas/Pasco County Line, is the subject of two planning studies being conducted by the Florida Department of Transportation (FDOT) District 7 Office. The purpose of the studies is to improve mobility and safety along the corridor for all transportation users in coordination with local government plans affecting its adjacent land uses. Forward Pinellas is working with FDOT, as well as its local government and other agency partners, to ensure the project addresses the needs of the communities and people served by the corridor. One of the studies addresses the section between Park Street and Belleair Road in Largo and the other covers the section between Belleair Road and the Pinellas/Pasco County Line. Note: Recommended improvements for the Belleair Road to Pasco County section of the corridor are identified in the Corridor Alternative Strategies Report. Recommended improvements for the southern section will be identified in a separate report that will be posted here when completed.